I started blogging for fun, to cure boredom and communicate with other people with the same interests as me. Through blogging I have spoke to some of the kindest people in the world and I feel so fortunate to be able to call them my friends. They’ve reassured me, cheered me up and given me advice. It’s incredible when you think about it. However, recently I’ve found that the blogging world isn’t always a nice place to be. There are two main themes that are currently on my mind: greed and dishonesty. It’s something that I am seeing all too often nowadays. I must point out, this does not apply to everyone. It’s just a certain few (thousand) that are ruining it for others. If you’ve ever looked at #bloggerswanted on Twitter then you may understand where I am coming from. I’ve seen bloggers begging for freebies to review on their blogs and events to attend. I’ve seen bloggers questioning why they were not invited to a certain event – god forbid they’d be left out. Personally, if I were a business looking to connect with bloggers I would be discouraged to work with someone who bombarded me with “Send me free stuff” messages. Greed is not pretty. Greed also doesn’t get you anywhere in life. Get to the back of the queue and wait patiently. Good things come to those who wait. A lot of comments have been made in light of the Zoella/Girl Online saga, and believe me, I’ve bit my tongue. However, after pondering my argument for sometime, drawing conclusions on what she had actually done wrong, I realised the worst thing about it all was dishonesty. I’m not blaming her for using a ghost-writer but I do think that she was very dishonest to her fans. At no point did she make it clearly that it would be a collaboration between her and another author. There is a difference between getting help and getting someone to write for you. Dishonesty also comes from not telling your readers when you have been given something to review for free, or when you are being paid to say something. Getting free stuff is nothing to be ashamed of, so why hide it? Honesty is the best policy. If you can’t be truthful to your readers then you shouldn’t be running a blog. In the spirit of the Christmas season, let’s stop the greed and dishonesty, whether it’s online or in the real world. Just because others are greedy and dishonest doesn’t mean that you have to be too. Is there anything you dislike about the blogging world? Other posts from the “My thoughts on blogging…” series include “Returning Comments” and “Product Reviews and Being Original“. I don’t even know what the Zoella/Girl Online thing is about. I’m so out of touch. I think bloggers can be quite clique-y which is sad, and very arrogant at times. Then again I avoid these kinds of bloggers so I don’t see much of it. The Zoella thing was kind of blown out of proportion by the media who like to get excited about the most uninteresting news. Basically she didn’t write a book she claimed to write. Sadly I’ve seen something similar. I just stopped following a couple of blogs because they had too many paid posts. If 8 out of 10 posts start with “I’ve received this wonderful thing in the post” and finished with “you have a 5% discount with the code”…it’s unpleasant. I feel like I’m reading advertising in newspapers. I don’t say I’m against paid posts or advertising. But, this should be a small part of the posts. I looks greedy and, more important, boring. I also had the opportunity to receive emails from blogger asking for free items. I wasn’t impressed with that either, mainly because they had sloppy blogs with poor pictures and only a few followers (not all, of course). I don’t mind paid post, but having them constantly is very annoying. I think bloggers should only promote products/brands that they truely love rather than what ever is going free. I have actually turned down many sponsored post opportunities because I simply have no interest in the product. i never knew about #bloggerswanted until today. tried checking the tag on twitter and wow it’s so overloaded i’m confused now. all this time i’ve been blogging, i’m only aware of bloggers who beg for visitors, not freebies and it’s actually one of my pet peeves; bloggers visiting your comment box only to say something like “hey check out my blog” instead of saying something related to your post. how respectful, sigh. i think i get that we all like freebies. we all like to be sponsored by this brand or that brand because it can benefit our blog too but begging for freebies…. i’m probably horrible but that’s kind of pathetic? or maybe that’s just me. and again, if you didn’t talk about the zoella thing here, i would be blind about it. i guess this shows how much i never really dig deep enough about what’s going on inside the blogging world. or maybe i’ve never really wanted to care? i don’t know. i just want to think that blogging as something fun, that it’s just a way to express our opinions etc instead of seeing it as something that can be as complex as…politic. Ugh, shallow comments are the worst! You’re not horrible at all! I agree that it is pathetic. I think it can be very difficult sometimes to judge whether a person genuinely likes the product or is simply saying it for the freebie/money. I think businesses are more likely to send out their products to bloggers who re going to make the product look good. Oh gosh…there’s so much that annoys me in the blogging world. First, that people who treat their blog like a business have more or less changed the definition of blogging and turned it into something business-like that generates money. The people who blog for fun and for the love of sharing their lives these days are considered kind of odd because of that. I hate that and I totally want to reclaim blogging concept as it used to be. Most of my other pet peeves have to do with the monetising hysteria. People can’t do anything online anymore without having to monetise it. I despise blogs full of reviews and giveaways, and sponsored posts are just ridiculous. My reasons for reading blogs do NOT include getting free stuff or finding products. I’d go to a webshop for that (well, not the free stuff, lol). I like to read about people’s lives, and when their blogs turn into commercials, they become boring and uninteresting and I think it’s so sad that people destroy good blogs like that. And then all those outfit posts. Excuse me but I don’t give a **** about what you wore that day or where you bought the stuff. Seriously. And the “follower” hunt. It’s ridiculous. Who cares about the number if it’s only the number of people who clicked a button? I doubt that all those people are actually reading the blog. It’s just a show-off thing or possibly for SEO but does it really matter if people don’t read the blog for real? I think blogging is about sharing and connecting with people and with today’s blogging behaviour trend, that’s dying out. I’ve never made a penny from my blog (even though I have AdSense which generates like 1p a year!). Sometimes I think I would like to make money but if that means changing my content then that is not something I am prepared to do. I also like reading about people’s lives. I definitely prefer reading blogs by real people i.e. real job, real issues, real life. I actually quite like outfit posts but that’s because if I didn’t look for inspiration online I would be dressed terribly. I have no fashion sense! Actually I’ve been looking more at outfit posts lately for inspiration but I mainly go to Pinterest to find them. I think it’s so discouraging to look through a blog directory (for example Better blogger network or the likes) and only see that 90% of the blogs there are outfit or fashion/beauty blogs. Maybe this is the beginning of the end of personal blogging, but I really would hate that. Blogging should be meant for fun, whether you’re being paid or not! 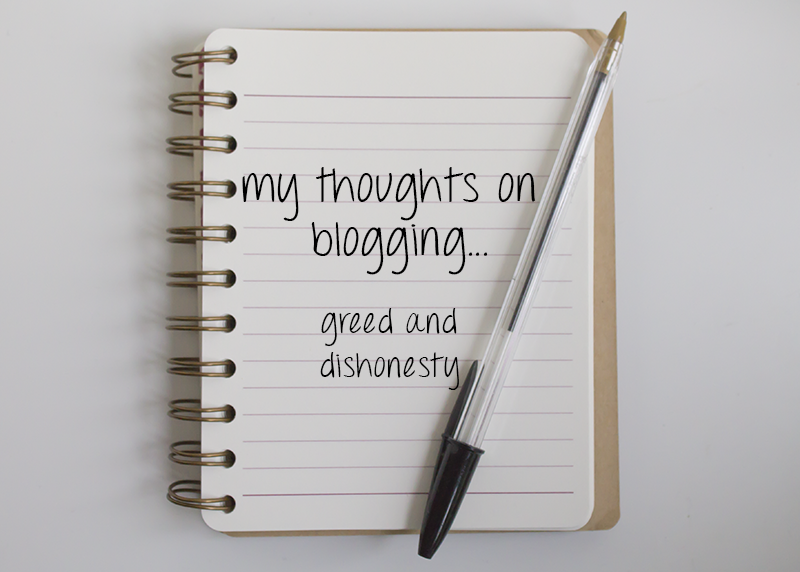 :D. But unfortunately, there’s that greed and dishonesty that may come with blogging. Greed and dishonesty is not pretty and I agree with you! Work hard and rewards (such as freebies) will follow. I feel that seniority doesn’t matter as much compared to what you have contributed to make yourself a known person or something. I find no shame in saying whatever I got was free. There’s no shame in that kinda stuff unless you stole it or got it illegally. The thing I dislike in the blogging world is the desperation people have for views or jealousy people have towards other people. *___*. There’s too much problems with that kind of negativity. I agree! It’s nothing to be ashamed of. Jealously is also one of my blogging pet peeves. I hate to read comments on other people’s blogs that are clearly written by someone who is just jealous of them. It’s okay to be jealous but it’s best to keep nasty comments offline.Positivity only! I know! I could never imagine starting a blog just for freebies and money. I’m sure back when I started blogging many years ago that wasn’t even a thing.